Use them to decorate your own tree, or make a set for the grandparents as an early Christmas gift. Or start a set this year and add to it with new photos year after year. 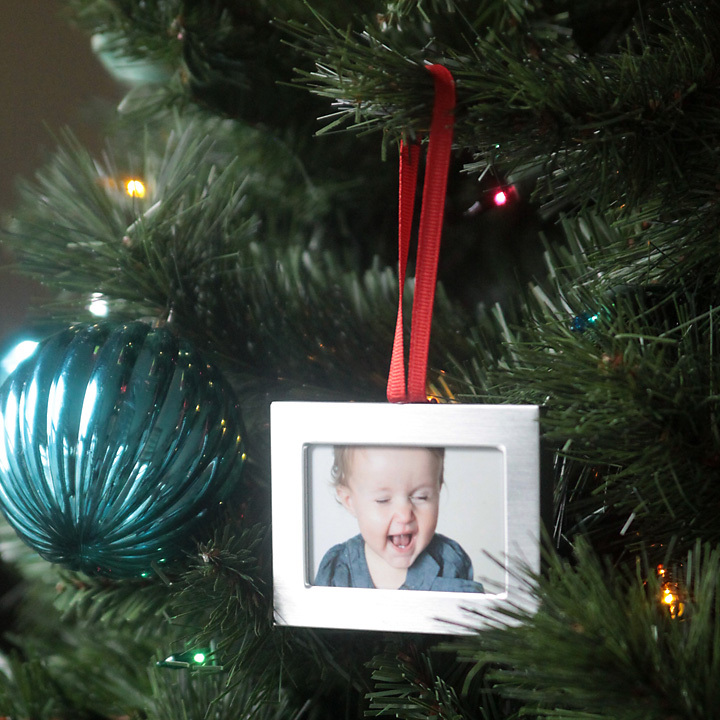 What could be cuter on your Christmas tree than pictures of your family? 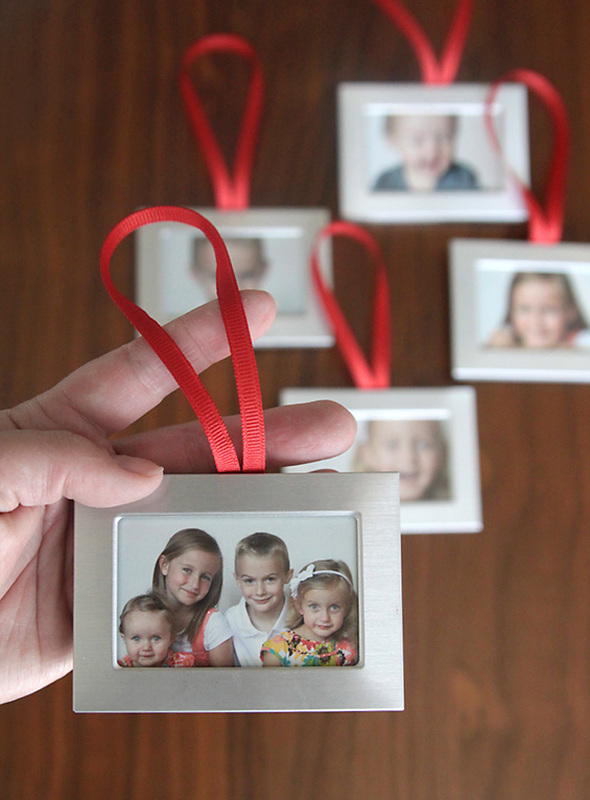 To make the ornaments, you’ll want photo frames that hold wallet size photos. I found mine at the dollar store. You’ll also need a glue gun and some ribbon, as well as the photos you want to use printed out at wallet size (3.5 by 2.5 inches). I made all of mine horizontal, but you could do vertical photos too. Slide the glass and backing out of the photo frame. Cut a loop of ribbon that is 9 inches long. Place a dot of hot glue in the very center of the photo frame on the back, as shown above. Press both ends of the ribbon over the hot glue, making a loop. Then put more glue on top of the frame and press both end of the ribbon down so the ribbon is glue to the top of the frame as well as the back. Let the glue cool completely. 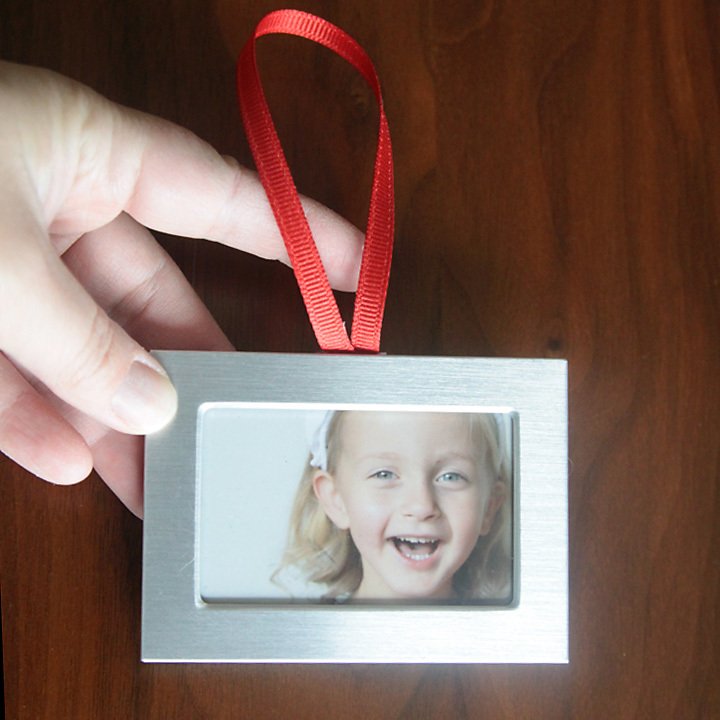 Slide the glass, photo, and backing back into the frame, then hang on your tree! Since you don’t glue the ribbon to the photo, you’ll be able to swap out photos at a later time if you want. I make ornaments out of fabric and felt, for grandchildren,I think of something. they did that yr like their driver lisence,or a frist at the fair,embroidery their name and the yr.on the back with my machine. It is fun to look back,when they leave home they will have ornaments.